Note: the following includes affiliate links. If you order anything after clicking one of these links, I may receive compensation. For more information, please see my Disclosure Policy. Thanks for helping to support my site! Back in May, I decided to try the Darn Good Yarn of the Month club. I’ve had this subscription for the past three months, and I thought it was time for me to share my impressions with all of you. I’ve talked about Darn Good Yarn several times here at Knitting for Charity. I shared the story behind this company about a year ago, reviewed two of their yarns (Gumball Recycled Silk and Yak Wool), and have mentioned the many times I’ve used their yarns in my What I’m Knitting Wednesday posts. Before I get into the Darn Good Yarn of the Month club, let me tell you a little about why I’m so fond of this company. I doubt I can explain what this company is all about better than does Nicole Snow, the founder and CEO of Darn Good Yarn. Below is her video describing, in her own words, how it started and what they continue to do today. In a world where so many supply chains are filled with non-livable-wage earners (or worse, actual slave labor), I greatly appreciate companies like Darn Good Yarn that are offering people in developing countries a chance to make livable wages and support their families. Subscribing to the Darn Good Yarn of the Month club is a small way for me to help support this mission. To be honest, though, I probably wouldn’t continue my Darn Good Yarn of the Month club subscription if I didn’t enjoy the heck out of their yarn. But I do! In my first three months of membership, I have received two hanks of DK-weight silk yarn and a hank of chiffon ribbon. First I received this gorgeous rainbow-colored yarn called Roving Silk in Watercolors. I used half of it to make a lovely lacy summer scarf, and the other half to make most of a crocheted prayer shawl (photo of this to come). The following month, I received Reclaimed Chiffon Ribbon. I had no idea whatsoever what I would do with it, to be honest! Fortunately, the package came with directions for finding Nicole Snow’s arm knitting tutorial on YouTube. I had never arm knitted before. But I’d heard about it and always thought it sounded like fun. Before now, though, I never felt like I had a good yarn to try it with. My Chiffon Ribbon turned out to be the *perfect* yarn to try it with! The two silk yarns I’ve received were absolutely wonderful! They were so soft, I felt like I was knitting clouds. However, you do have to be careful not to pull them too tightly while you’re knitting (or crocheting). I broke each of the silks once while I was crocheting. The Chiffon Ribbon was super-fun to arm knit with. It’s not very soft, but it’s not terribly scratchy or stiff either. I love the scarf I made from it, and I’ve worn it a few times already. It feels quite nice against the skin. I don’t know how it would feel to use actual knitting needles or a crochet hook, but for arm knitting it was perfect. I think what I have enjoyed most about the yarns is how much of it there is! DGY does not skimp on the hank sizes here. 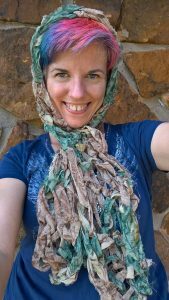 As I mentioned, I was able to knit a lacy summer scarf and a large portion of a prayer shawl with my Roving Silk. I used about a half a hank of Chiffon Ribbon to arm knit a scarf (I’m planning another for one of my daughters). I haven’t even mentioned the bonuses! Each Darn Good Yarn package includes both a pattern and a bonus gift. With my Roving Silk, I received a free set of bamboo size 8 double-pointed needles. I wasn’t sure what to do with them at first. But now that I’m in the midst of knitting a cell phone purse that will require a nice long strap, I think these will be perfect for creating I-cords! 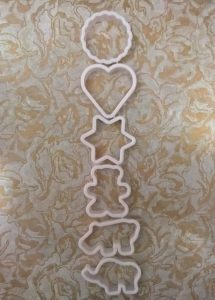 With my Chiffon Ribbon, I received an adorable set of cookie cutters. Unexpected in a yarn subscription club, but also utterly delightful. The hippo is my favorite! And with my Recycled Silk, I received a tote bag. I can’t tell you much about it because almost the moment I opened my package and pulled out the tote bag, one of my daughters grabbed it, and I haven’t seen it since. It must have been good! To me, one of the biggest pros of DGY of the Month is the price. For $10 plus shipping, you receive an absolutely beautiful hank of yarn, a bonus gift, and a pattern. 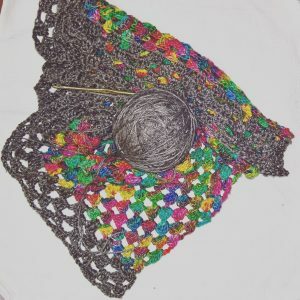 Though I’ve only used the pattern included once (for the Chiffon Ribbon), it is really helpful to receive a pattern along with your yarn that you know will work. Another pro is the quality of the yarn. All the yarn I’ve received has been beautiful and enjoyable next to the skin. In the case of the silk yarns I’ve received, I could be happy knitting nothing but those for the rest of my life. They’re that delightful! To me there are really only two cons to DGY of the Month. One is that you never know what kind of yarn you’re getting. This is not a yarn club where you’ll hit “skip” if you don’t like the kind of yarn scheduled. You literally have no idea what you’re getting until your package arrives. To me that’s part of the fun, but for people who don’t really want to be surprised by a yarn shipment every month, it could be a big disadvantage. The other con is that if you choose to skip, you’ll want to do so before the first of the month you want to skip. And you have to do it deliberately. It’s not a difficult process, but if you’re a forgetful person (like I am *cough*), you could wind up receiving (and being billed for) yarn when you wanted to skip the month. In the interest of fairness and transparency, I will mention that I received my second month’s yarn very late. And the only reason I knew it was late was because I received an e-mail for yarn subscribers regarding that month’s package, and I hadn’t gotten mine yet. That said, when I realized I hadn’t gotten my package yet, I e-mailed DGY, and I received my package just a few days later. So they took care of the issue quite quickly. Note: the following includes affiliate links. If you order anything after clicking these links, I may receive compensation. If you decide to subscribe to Darn Good Yarn of the Month, in your first subscription package you’ll receive a card that looks like this. Be sure to hang onto this card. It has important information like how to make changes in your shipping or billing information and how to skip a month if you need to. 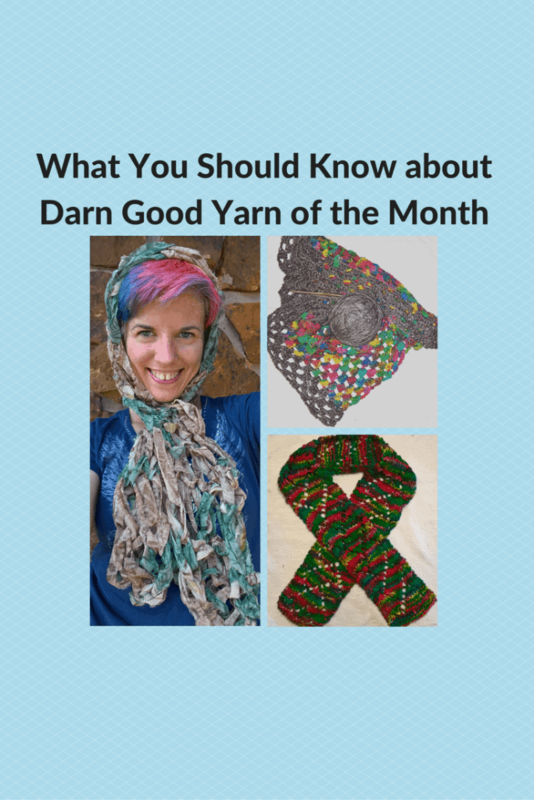 So, should you subscribe to Darn Good Yarn of the Month club? The idea of receiving fabulous yarn every month. The idea of getting monthly mail that isn’t a bill! The insanely great price for great yarn plus bonuses. Being able to support a company with such an ethical mission. Like paying for mystery yarn. Have space in your budget for the monthly price. Know if you’d have space in your budget every month, and you’re quite sure you’d forget to skip packages. How about a Free Box? 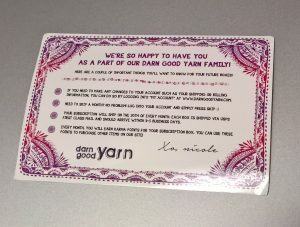 I have a special bonus raffle to offer, courtesy of Darn Good Yarn themselves. Three lucky readers will get the chance to win their very own Darn Good Yarn of the Month subscription box! That’s right: just comment on this post and tell me why you’d love to win a box. I’ll leave the comments open for 2 weeks, and then I’ll hold a drawing from among the commenters. Three winners will each receive one free box directly from Darn Good Yarn! Also, please comment only once. Additional comments won’t get additional entries. Comments are now closed. The drawing has already taken place; however, you can still order your Darn Good Yarn of the Month subscription from the link below! Note: the following is an affiliate link. If you order anything after clicking this link, I will receive compensation. For more information, please see my Disclosure Policy. Thanks for helping to support my site! Ready to try it out for yourself? Click here to subscribe to the Darn Good Yarn of the Month club! This would be a wonderful monthly surprise! Excellent!! Sounds like a great idea. I usually knit with wool or wool blends and this Darn Good Yarn of the Month club sounds darn good. The variey of yarns sounds wonderful. So many great yarns to try, Elena. I look forward to every box! You have convinced me to give this monthly subscription a try. I have been waiting for a review. The thought of receiving a monthly surprise yarn totally intrigues me. I’m constantly looking for new yarn and patterns to try so this would totally satisfy this desire. Thank you for the review! I like the idea of a box yarn in my mailbox even better than a box of food! I need to retire so I have more time to craft. Thanks so much Katrina for shining light on this cool option. Happy Knitting! All of my “knitting” is done on a round loom and is usually hats that I donate to causes. Just donated 175 children’s hats to the school district for teachers to give out when the weather gets cold and for a homeless shelter. I am currently working on red hats for the newborns at the local hospitals for the month of February for Heart month. Would love to try some new kinds of yarns. Thanks for offering us the chance to win a box ! I love the thought of a wonderful fiber surprise each month. A new yarn and a new pattern for a reasonable price? Can’t beat that. ???? It is indeed quite unbeatable! Beautiful colors, and helps others. What an awesome combo!! Looks like it is a dream to work with. If it is as soft as it looks, I may hoard it and only take it out on special occasions. When Nicole recommends, we listen.. I am so intrigued and love that the “buy in” is so reasonable. I have lots of standard yarn and love how this company curates unusual yarns to try! Thanks for a wonderful introduction! I’d love to win — because I really like their approach to the world, and as a definite plus, the yarns are beautiful. I’ve always wanted to knit with silk but have never had the opportunity due to my low income. This raffle is a very good idea. I need more yarn love me I need another hole in my head – most of it skated for children’s chemo hats and infant burial garments. But the idea of running my fingers thru silk is delightful!!! Thank you for doing this!!! Hee! I hear you, Cheri. You’re very welcome! I love the idea of getting a yarn surprise every month! One of my granddaughters (a delightful almost-8-year-old) is just dying to learn to knit, spurred on by the fact that she sees me knitting and the fact that they have a new baby girl at home and she wants to start making “special things” for her new baby sister. Hopefully I can teach her how to knit and I think that a try at a subscription might just get us together and get her looking forward to knitting something different. Aw, what a wonderful idea! Love it. I enjoy reading your newsletter. Thank you so much. I also enjoy ghe patterns you make available. Thank you fof the opportunity to win such a great prize. I just started my subscription and received some beautiful yarn with needles and a hook. Can’t beat the price. Cheaper than other yarn club subscriptions and I love the good the company does. I would love to try it but it doesn’t except prepaid cards. You have to understand that everyone doesn’t have a bank card. When you have a prepaid card you can’t spend no more than whats on it. It’s really a shame that a person like me can’t enjoy finer yarn or a subscription like this because of the type of card I carry. I’m so sorry, Barbara! I wish I could help, but unfortunately that’s the way the company does business. I agree that it’s a shame. Hopefully someday they’ll be able to find a way to offer subscriptions even to folks who use prepaid cards. My goodness, what a lot of scrolling through wonderful comments to arrive at the space for my “two cents.” I’ve been reading your comments about DGY and trying to resist accumulating even more yarn (!) but the video of DGY founder really grabbed me. This is a way to do good beyond our local community as well as break the “hats and scarves, hats and scarves” rut. Thanks, Nicole. It grabbed me too! I was trying to come up with a new and fresh description, but after watching that video I thought “heck with that, no one can explain it better than this!” You’re welcome, Fran! The yarn looks sublime and I love the price! It is, and it is a fabulous price! So I need regular shipments of MORE yarn like I need another hole in my head. . . which doesn’t mean I wouldn’t love to try this. 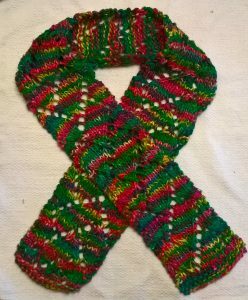 I knit for charity every Thursday, and when I knit for other people (not family) any $$ I get goes to my personal favorite charity. . . love your site and thanks for sharing this. I’m so excited about the Darn-Good-Yarn offer and hoping I’ll win! Thanks for the opportunity. I do enjoy your blog–and knitting! Darn Good Yarn: What a terrific club for yarn lovers of the knitting world!! I drool with envy when knitters talk about various yarns- and I have no clue as to what they are like! Living in small-town-America [which I love!] doesn’t give me the opportunity for local yarn shopping. Recently started purchasing new yarns online – but of course you can’t see the true colors, and can’t feel the textures. It sounds like this Yarn Club will become a true friend to those in need of yarns out of reach of their fingertips [like me!] Thanks for always giving us places to find the creative and do the unique. You are a blessing for using your gifts and talents. Thanks, Nicole! Thank you for this wonderful article about Darn Good Yarn. What yarn lover wouldn’t be thrilled to get yarn every month, with a chance to help these women in their own business! Such an inspiring idea! Thank you for your wonderful charity newsletter, Nicole! Have a great weekend! I would love to win and be able to try the yarn. I love to knit and since I retired, I am doing more and more knitting. Most of it I give as gifts!!!! I like your web site and love your charity patterns!!!! Thanks for the opportunity to win this contest!!!! Thanks for sharing this information! I’m not in a place where I can subscribe at the moment, but we are eagerly anticipating an empty next in the near future and I hope to have a craft room. That’s understandable. Hopefully in the future you’ll be able to subscribe. And who doesn’t love free yarn?? I would love to win a box! I love surprises!! Greetings, I eagerly look forward to reading your blogs and news. Helps me to know that one person can make a difference. Knitting is a gift we give ourselves AND one that we can give away in love. Thank you for your guidance, humor, and resources. Thank you very much, Sally! I appreciate that. I would love to win a box, I love to try new things! Nicole, I enjoyed your thoughtful review of Darn Good Yarn. After wanting to try their subscription for a while, you have convinced me to do it! I joined the DGY yarn of the month club when they first started. I love the club. I wouls suggest that DGY to allow you to pick a theme. Like bold colors, pastels, etc… The products are very nice ( wooden yarn bowl), fun free and purchase patterns and if you need help…. they respond back to you or have videos! I like that idea, that could be fun! Maybe in the future they’ll adopt something like that. As for the yarn bowl, I really want to try that eventually myself. I’ve bought one of their kits before – nice product! I’ve been very pleased with the quality of their products. I’m new to knitting and have really been enjoying this! I saw about this subscription online but so glad to see your thoughts on it! I think I’m going to have to try it out. Thank you!!! Judy, this is a great way for a beginner to build her stash for sure! I love surprises!!! Winning would be lovely. Thank you for your review of DGY … it is appealing and I will look into how I can join. Thank you Nicole. As I said earlier in my e-mail I’m so excited to have a chance to win the subscription. I have been knitting since I was 11 and iit has been a tough road since I am left handed. I do love to try new patterns and yarns and this would be so much fun. This sounds like a wonderful way to try new yarns, the ribbon yarn sounds fabulous! Thank you for the great information. You’re welcome, Linda! I loved the chiffon ribbon & am looking forward to trying other ribbon yarns. I was unfamiliar with this yarn company. Thanks so much for sharing about it! Oh my goodness, I didn’t know about Darn Good Yarn until I read your post. How could I have missed this! 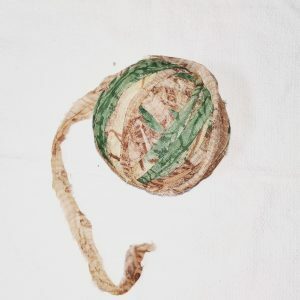 I don’t know if I’ll go in for their subscription service, but I took a look through their yarns, and the Recycled Lace Silk jumped right out at me! I absolutely love that I’ve found another source for ethical fibers! So glad I could introduce you to Darn Good Yarn, Sarah! That banana fiber yarn does look interesting, doesn’t it? I’m fascinated by it and hope it lands in a box at some point. I’m not rolling in money myself but I don’t have a problem with $10/month for yarn! And don’t worry, it isn’t a small amount of yarn at all unless you’re knitting blankets or sweaters! Thanks for commenting! Id love to try this, and I’d be happy knowing it was a good company, too. I tend to start a new project every time I see a new yarn, but then I never (okay, not never, but a lot) finish them. Getting a new package every month might encourage me to finish something! I hear you, Bonnie! Here’s my new routine: A) get new DGY. Get excited to try it. B) Unable to resist the lure of new fiber, I cast on for a new project with my new yarn. C) I force myself to put down the new cast-on and tell myself that I absolutely cannot pick it back up again until I finish a previous project. I have bought the most amazing sari skirts from DGY and love what this company is doing to empower their workers. Thank you for the review Nicole. I’ve wondered what their yarn was like. I’d love to win a box and I’m really thinking about subscribing now! You won’t regret it, Tamara! Please include me in your raffle. I was impressed by your detailed and honest comments, and I know that the subscription club must be a learning opportunity for every knitter: I learn something new every time I work with a new yarn. I would love to try this yarn. It sounds fun to knit with. And more fun to give the project away. I have heard good this things about this club. I enjoyed reading your review. I think I’ll sign up because I love surprises and love to knit! Also, my brother-in-law was raised in India as a missionary’s kid so he’ll really appreciate the support to India’s people (and he also knits….win-win). Thank you for posting this Nicole! I would love to win a box of this yarn because I have thought about trying the yarn subscription, but wasn’t sure I would like it. Your review was very helpful. I’m glad you found it helpful, Joyce! Since I retired, I have had time to really get back into knitting. I started out making hats for women’s/children’s shelters throughout the country. Then last year my sister had a rare type of breast cancer and I spent 7 months as a caregiver to her. That was the most humbling experience of my life. So now I also knit sleeping caps for cancer patients as well as hats for preemies. I just sent out 35 hats to various groups to send on to those in need. This year I’m going to expand my donations to include mittens. The yarn would help me with not only costs, but also using yarns that are unique (and might bring a smile to those in need who receive my knitted items). It certainly would. Thanks for all you’ve already done, Melinda! I can respond to this in one word…MOTIVATION! I’m at a point in my “knitting adventures” that I’m struggling to find things I want to knit, and I think that’s because I have such a hard time making a decision on which yarn I want to use. As we all know…there are so many to chose from. I love the company’s mission and what they represent, which is a huge bonus for all of us. Well, I know I said I could answer in one word, but here I am…several words and not done yet. Anyways, thanks Nicole! As always, you manage to keep me interested and excited, even if I’m lacking a bit of MOTIVATION right now. As I’ve said before…you ROCK! This company fits right in with my commitment to Kiva loans. Thanks so much for making it your discussion this week as I hadn’t realized what their mission was before now. I would love to work with their bright yarns and lovely silks while thinking of those who create the yarns being able to support their families. Now I’m off to try my first month subscription. I belong to a fiber group that that will focus on a variety of charity organizations. What fun to have a mystery yarn to use! While your video links did not work for me, I applaud a company that strives to make a difference. Darn, I’m sorry the video links didn’t work! If you search “Darn Good Yarn” on YouTube you should be able to find their channel & the videos I put in this post, if you’d like. I agree though, it’s such fun to get mystery yarn every month! I would live to get a mystery box on the chance that there is a silk yarn inside! I’ve never knit with silk and would love to try. Plus, I am excited about the colorways – the ads always show such vibrant, happy colors. I’ve been absolutely delighted with my yarns and the colors for sure, Angela! I’m actually using some of my shimmery silvery gray recycled silk yarn to knit a barracuda… haha! Thanks for the continuing info about this company. I am intrigued by the idea of getting mystery yarn in the mail and am seriously considering subscribing. Thanks for the helpful e-mails, free patterns, and links. You’ve given me so many good ideas! What a wonderful way to introduce knitters to a new site. I thoroughly enjoyed and now have a new appreciation for this organization. I didn’t fully understand the wholeness of this organization, but now I do. I also have to Thank You for your website. I would always knit items and never knew where to send them to. You have opened up my interests to so many great organizations and I honestly can’t thank you enough for that! I also look forward to your newsletters. I have to admit that when you reduced the number of newsletters; I was disappointed in not receiving them so often. Thank you for all that you do!!! I love this company and am already subscribed, but wouldn’t mind an extra package. Been thinking about upping it to the premium monthly kit. That kit has 3 skeins plus extras for $30. Love the feel and quality of their products. They have excellent customer service. Thanks for sharing! I may upgrade my own subscription eventually, though my current subscription is perfect for my needs. I have a large enough stash without overloading it with 2 additional skeins per month, lol. You are most welcome, Lisa. I agree, the company’s mission is a great reason to support! What a great idea! I would love to make something special for the Cat Chance auction. This group collects roaming cats, neuters them and, after medical care and shots, either returns them or puts them on an adoption list. I see myself knitting a scarf or shawl and would love to receive a surprise package so I can use my artistic flare! What a terrific idea, Katrina! Thanks for sharing.